Virtual Personal Assistants creation Using AI. Today communicating with each other is no longer the same. Technology has completely evolved the ways and means of communication. We are heading towards a future in the conversational artificial intelligence (AI). The advancement in smartphone operating systems has played a significant role in making virtual and digital assistants an integral part of our everyday user experience. They have not only managed to make an impact on our personal lives but businesses as well. Some tech giants such as Apple, Facebook, Google, Amazon, Microsoft, etc. have spent a fortune developing their own Al-based personal assistants. 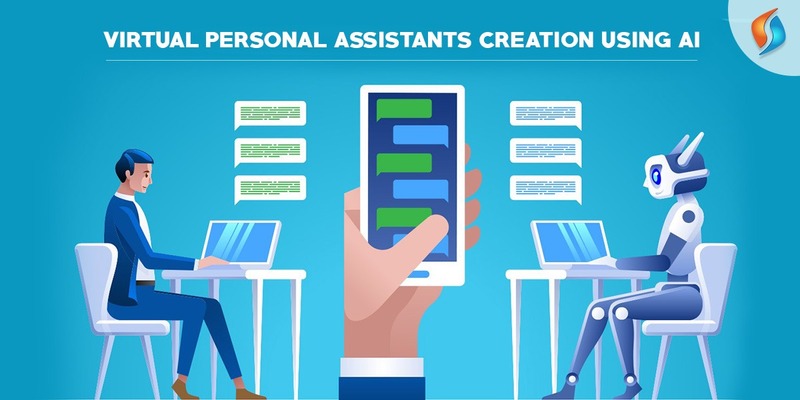 A recent study done by Statista has revealed that the market for AI-driven personal assistants created by AI development companies will reach more than $ 12 billion by 2020 with approximately 1.6 billion active users. These staggering statistics reveal the ever-growing impact of AI services based virtual assistants. Over the past few years, the number of Artificial Intelligence personal assistants has gone significantly up. Applications such as Siri, Cortana, Bixby, OK Google, etc. are becoming more and more popular with time owing to their ability to make daily routines much more comfortable for users. Now the intriguing part is, how the AI is implemented in developing these virtual personal assistants by the AI development companies? Want to know more? This system can interact and can efficiently answer users’ voice requests. Its advanced set of tools can convert speech commands into texts. It works on a combination of two notions. One being the entities while the other is the roles of the subject. The system can also be used to develop applications like Siri. It is currently available for iOS, Android, Ruby, Python, and Windows platforms. The Amazon AI provides some features such as recognition of live speech, automated deep machine learning, converting text translation into text data and identifying visual objects. These features help AI developer in designing applications based on the cloud so that they exert a minimum load on user devices. If you wish to create your own Al solution, then IBM Watson is the platform to look out for. Its ability to process live speeches and machine learning make it suitable for developing AI-based virtual assistants. It makes use of thousands of algorithms that reduce the percentage of errors in applications based on IBM Watson. This API is a part of the Google platform. It makes use of data, generated from the experience of user interaction. Hence, it can differentiate between sentences that are slightly different from one another. The applications needed for educational purposes or business process management can be developed using this API as it possesses a vast database of information. It is an open source code that you can use to create virtual personal assistants based on AI. Melissa has an intelligent processing of voice commands. It is based on Python programming language and is currently also available for OS X, Linux, and Windows. The Artificial Intelligence-based personal/virtual assistants today though have limited abilities, but it is a significant breakthrough in the IT sphere. They are slowly developing as practical tools to make our lives easier and comfortable in the high tech environment of today. We at Signity Solutions have years of experience as one of the best AI development companies in India. So, if you also wish to take the services of AI-based personal assistants or develop your own AI solution, our dedicated team of developers is always at your service. Feel free outsourcing to India and contact us here, and we will revert at the earliest. I am an enthusiastic internet marketer.